Some old friends came over to lunch. Their daughter who is a vegetarian was attrnding as well. Hmmm, what to make? I settled on ribolitta, a hearty Tuscan vegetable soup, which I normally would have made with pancetta and chicken broth. Instead I made a vegetable stock and gave the soup base a more umami taste and feel by adding a Parmesan rind while it was simmering. The result? A delicious, healthy vegetable soup with real depth of flavor. I served the soup with garlic toast and a Caesar salad (no anchovies or Worcestershire) garnished with homemade croutons. We finished off the luncheon with rum cake. It was all very tasty and a huge success even with the meat eaters. 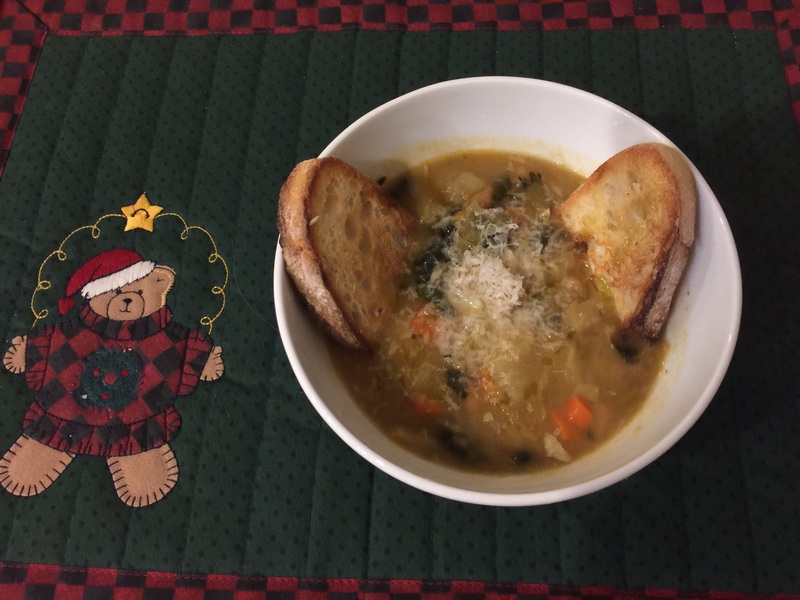 This entry was posted in Vegan, Vegetarian and tagged Ribolitta, Tuscan vegetable soup, vegetarian soup. Bookmark the permalink.